The summer of 1996 we went camping in the coastal range of central California. We drove through the coast mountains to get to San Simeon State Beach. Breezy and cold is the best description I can give for the beach camping there but the ocean was wonderful. The next day we did the "touristy" thing and went on a tour of Hearst Castle just north of where we were camped. The castle which was once owned by William Randolph Hearst, but is now owned by the State of California, has about 5 tours. We took the general tour to get an overall flavor of the mansion. 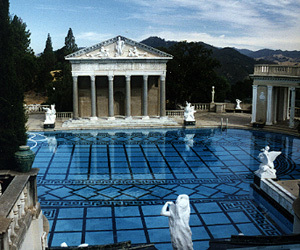 That took us past the Neptune pool, through a guest house and the gardens, and then into the main entry hall which is about 2500 square feet. The tour continued through the billiard room, dining hall and the kitchen and the theater. It finished at the indoor pool which is embellished with 24 carat gold leaf tile. There are other tours which are more specific and are generally for 2nd and 3rd time visitors. I have been there about 6 times, but each time I go, it is always with someone who has never been before, so I've taken the general tour quite a few times but none of the others. It's a wonderful place to learn a little about Hearst and the culture of California during the 20's through the 50's. The drive up or down the coast is also spectacular and highly recommended.